Boston and Maine RR History - The Andover and Wilmington RR was the earliest predecessor of the Boston and Maine. 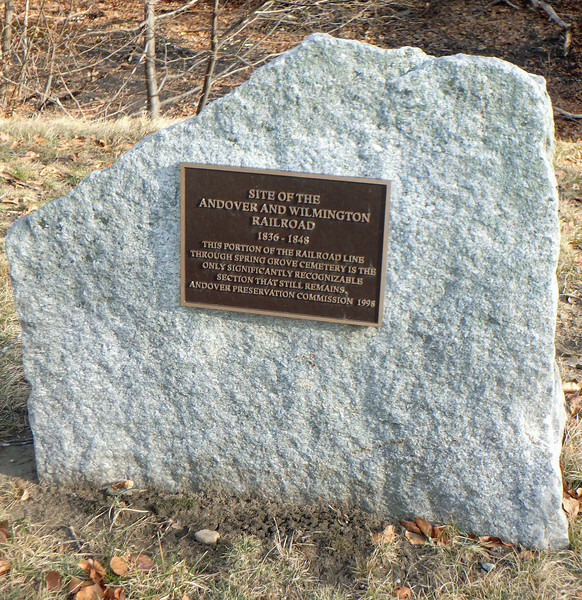 It was started in 1836 to connect Andover (and later Haverhill) with the Boston and Lowell RR at Wilmington. When the A and W was built the textile mill city of Lawrence did not exist. In 1847 and 1848 the original roadbed of the A and W was abandoned in favor of a new route that included Lawrence. This excavation in Andover's Spring Grove Cemetery is one of the few remnants of the original route.